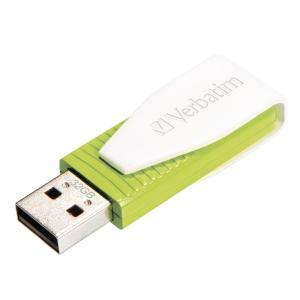 The Verbatim Store 'n' Go Swivel 32 GB USB 2.0 Flash Drive - Green features a built in swivel cap to protect the USB connectors when not in use. The cap also locks into place in both the open and closed positions. Simple and easy to use, just swivel open the cap, plug into any USB 2.0 port and drag and drop your folders and files. The Verbatim Store 'n' Go Swivel Flash Drive is perfect for anyone who needs reliable storage at their fingertips. The Verbatim Store 'n' Go Swivel Flash Drive is backed by a limited lifetime warranty.